Jenn Book Haselswerdt has been a theatre major since she was in high school, and realized when she came to her first yoga class more than fifteen years ago that she’d been experiencing asana and yogic breathing in almost all her theatre classes. She was hooked then, became more so during prenatal yoga when she was pregnant with her now six-year-old son, and came to a daily practice several years ago. She loves doing yoga with her son, and has used yoga in circle times for preschoolers, telling stories through breathing and movement. 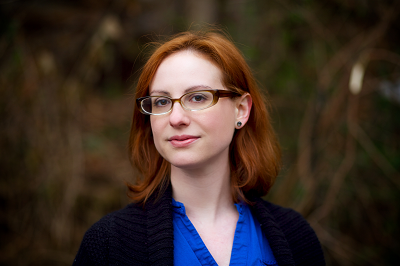 In her “non-yoga life,” Jenn is a theatre educator, dramaturg, playwright, and mom in Columbia, MO. As an educator, she has worked with preschoolers exploring nutrition through creative drama, trickster tales, and musical journeys; elementary schoolers creating fractured fairy tales, super heroes on stage, and pirate & mermaid adventures; and middle schoolers, devising original plays, writing and performing monologues, and using improvisation to explore dialectical behavioral therapy techniques in a partnership with social workers from The University of Michigan. She has worked in residency at a private school as an arts integration specialist, and has facilitated professional development workshops, teaching teachers how to use the arts in their classrooms. Jenn also works professionally with playwrights and directors, collaborating to create and consult on plays.